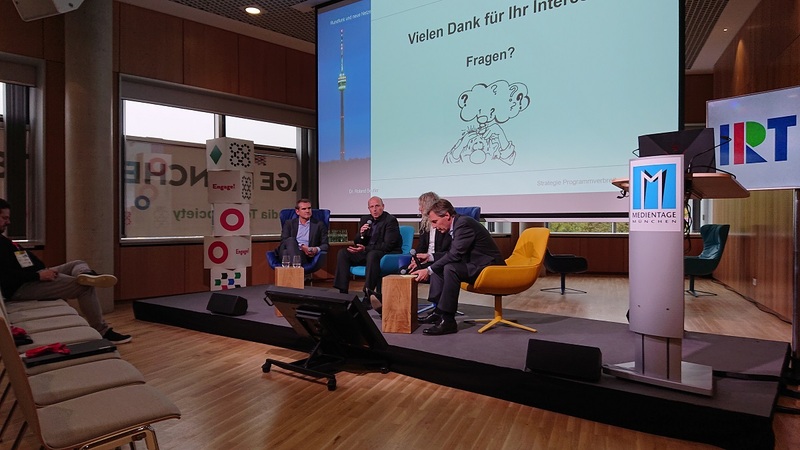 At the panel event “5G – Broadcasting in Open Networks and with Open End Devices”, the organizers of the Institute for Broadcasting Technology (IRT) and Bayerischer Rundfunk (BR) discussed on Wednesday afternoon with a mobile network operator, Deutsche TV-Plattform e.V. and a Broadcast network experts of the Südwestrundfunk (SWR) at the Media Days Munich on framework conditions for a speedy introduction of media offerings in the future mobile communications standard 5G. Presenter Helwin Lesch, Head of the Distribution and Controlling Department of the BR, first informed the approximately 80 visitors of the panel about the current test field 5G TODAY, which covers the large-area transmission of broadcasting services in the 5G transmission standard via the Wendelstein Mountain transmitter of the BR. In addition to the BR, the partners in this project are IRT, Kathrein, Rohde & Schwarz and the network provider Telefónica. 5G TODAY has just received a test license to broadcast 5G broadcast services and will gain its first hands-on experience in the coming year. In his keynote address, Dr. Roland Beutler, responsible for strategies of program dissemination at the SWR in Stuttgart, addressed key areas of application and issues in the further development of 5G media services in Germany. Media usage in the mobile future of automated driving is believed to be one of the key applications for media services in 5G, but requires flexible networks with re-channel capability, different modes of transmission (unicast, multicast, broadcast), and intelligent routing between different networks. In his opinion, this creates concrete requirements for standardization, grid expansion and regulation. “In the future, the 5G infrastructure will be of such social importance as electricity and water,” says Beutler. Massive investments in fiber optic expansion in Germany are just one of the logical consequences. In addition, basic issues such as the maintenance of net neutrality and the refinancing of network expansion costs would have to be regulated. A possible regulation of the Federal Government could be to lay down clear supply requirements for the location Germany and in return to allow the investing partners a favorable access to the frequency spectrum. Beutler also considers the increasing endeavor of the terminal equipment manufacturers to lead the user to selected program offers at the first access point in the terminal through apps and special menu guides. Smart TVs, network operators’ SIM cards and state-of-the-art terminal technologies like Amazon’s Alexa now have a clear gatekeeping feature that may be against the interests of broadcasters. An appropriate regulation of the terminals is a suitable way of enabling users to continue to have transparent and direct access to linear and non-linear broadcasting content. Beutler also pointed out that the rules of international frequency allocation in the ITU are historical and lagging behind the current technical developments in telecommunications. Instead of assigning spectrum for ITU services such as broadcasting, mobile or fixed, it must be considered whether it would be better to allocate spectrum for applications such as broadcast content, voice services or Internet access. In the following podium discussion, Gerald Huber, 5G Senior Program Manager at Telefónica, questioned the supposed harmony between broadcasters and mobile network operators. “We first want to examine how the high-tower high-power ‘data transfers in 5G are to be used correctly. From today’s point of view, mobile telephony requires much smaller networks in order to make our 5G offer in the desired quality available to our customers. So projects like 5G-TODAY should help us understand the technology better, “Huber said. Contradictory interests in the 5G infrastructure were also outlined by Holger Meinzer, Member of the Executive Board of the German TV Platform e.V., who highlights the topic from the perspective of the media and entertainment industry in particular and offers the participating stakeholders an exchange platform. “5G is, of course, a huge opportunity for broadcasting to bring both linear and non-linear content to all devices in a terrestrial broadcasting technology. But the interests here are diverse: while public broadcasters are interested in a restriction-free access without SIM cards, for example, private providers want to optimally exploit all the advantages of targeted advertising to clearly defined groups, “says Meinzer. Meinzer sees the challenge least in terms of the consumer devices, which would soon be available in a variety of forms. At the moment, however, there is still a lack of viable business models. For example, it is not enough just to recognize an additional time budget for media usage in automated driving. It would also be necessary to develop clear revenue models for this usage scenario. Finally, the previous mobile radio standards would have 4G and 3G already technologically supported broadcast services, but were not implemented due to lack of functioning models of collaboration. 5G infrastructure comparable to today’s network densities could not be expected before 2025. Recently acquired DAB + and DVB-T2 devices could therefore be used for a long time and providers had some time for the overdue dialogue on sustainable business and revenue models. The panel participants agreed that the 5G introduction should be supported through regulatory framework conditions. “100 Mbit data transmission for 98 percent of Germans is a very ambitious goal. The regulator has to think clearly about what he wants. If he thinks at the same time that he can generate maximum revenue by auctioning the 5G frequencies, it will be very tight for us, because such network expansion costs a lot of money and only pays off after many years, “said Telefónica representative Huber. Be the first to comment on "5G in Germany needs business models and regulation"